Being a North Indian myself and married to another, making Parathas is second to my nature! 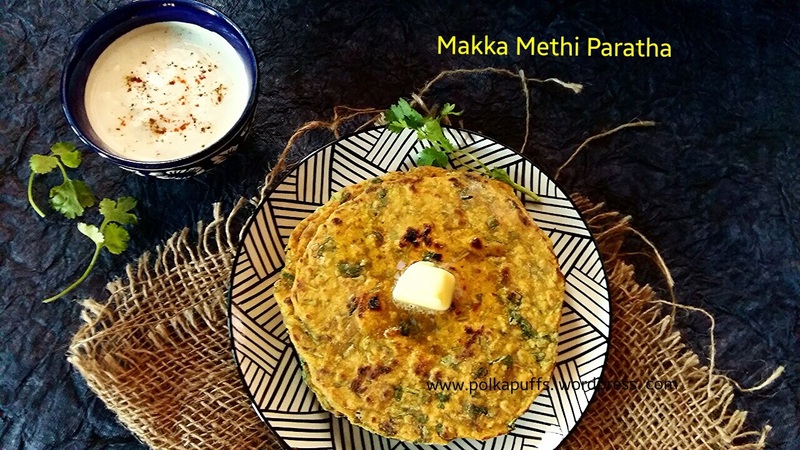 Be it for breakfast or a for meal for travelling….and as an accompaniment to most of the mains…a Paratha is quite important 😉😉 We have to have it….with a some ghee obviously! A few readers had asked me how I had rolled the Laccha Paratha when I’d posted Dhabewale Chole, so this has been long pending from my side! Take the flour, salt and 2-3 tbsp ghee in a large bowl. Mix well with your hands, add water slowly and make soft and pliable dough. Let the dough sit for about 30 mins. This is the same dough that is used for making rotis. Make a simple Roti but slightly thicker. Apply melted ghee all over it. Fold it as shown below like a Chinese fan, alternating the sides. Roll it tightly and gently seal the end. Dust it with some flour and roll it out with uniform thickness. Heat the pan, a put the rolled paratha in the pan on medium heat. Apply ghee on both the sides and cook well until brown and crispy. 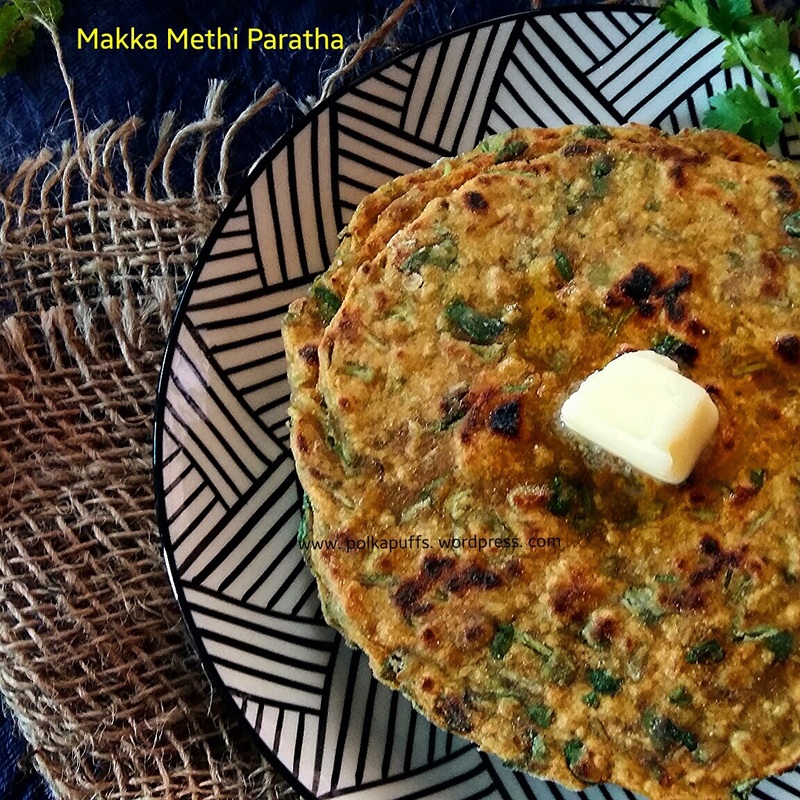 We Indians have an undying love for our wholesome Parathas (flatbreads)! It can be stuffed…plain salted with some chilli powder or flavoured with various greens along with the flour….there are too many to name 😀 And I love them all 😬😋….greedy, right!? 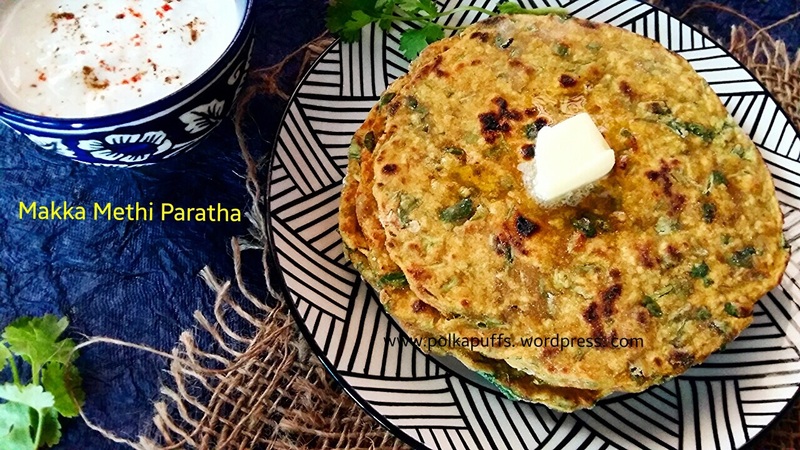 A perfect Paratha is crisp on the outside…and moist and flaky within….piping hot…slathered with some (in my case, a lot of) butter or ghee (clarified butter)…on my plate straight from the smoking griddle!! Wow! I am actually drooling just thinking about them😛 The earthy aroma is just too appetising to stop at a couple! Equipment: a large mixing bowl, measuring spoons/ cups, a rolling board, a rolling board, a griddle/ non-stick pan, a spatula. Add all the above ingredients except the water and the ghee meant for roasting in a large mixing bowl. Mix everything well. The moisture from the curd, methi leaves & ghee will bind the dough to a certain extend. Now, slowly add some water and make a tight dough. Try using very little water (I used less than 1/4 cup). Now cover & set the dough aside for about 15-20 mins to rest and absorb the flavours. Heat the pan on low flame. Alongside, make small balls of the dough, roll them in the dry wholewheat flour and using the rolling pin, roll it out to a diameter of 9″-10″, keeping the thickness of about 4-5mm. Now, pour some ghee on the pan, set the rolled paratha on the pan…cook on the first side for about 2-3 mins…then turn over and cook for another 2-3 mins. Apply some more ghee on both sides of the parathas. That’s cooked..set it aside. Repeat the same process for the rest of the dough.